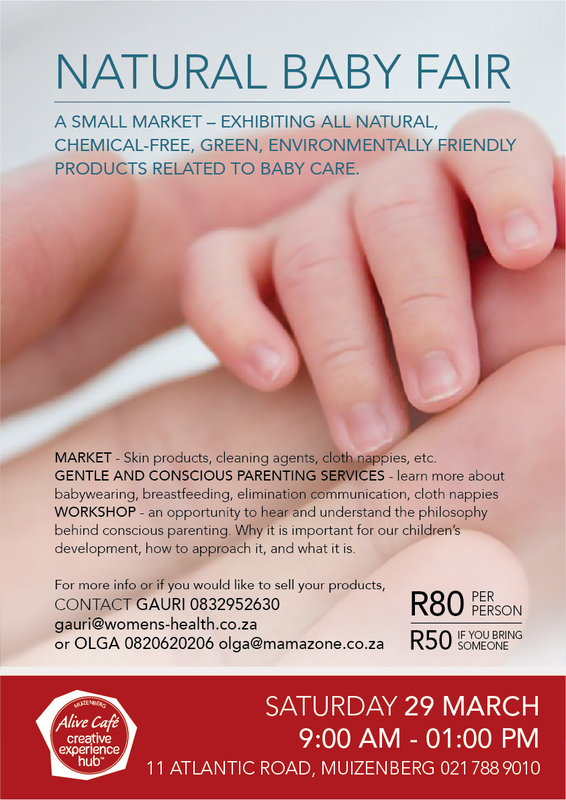 Why a Natural Baby Fair? I am a healthcare provider and a mother of 2 children. I am passionate about parenting (starting from in the womb) as well as a green-earth supporter. Daily I am seeing more and more people becoming more aware of what is going into the various products they are using. Be it skincare, clothing, household cleaners, toys, food and containers! More and more people are realising that these ingredients have an impact on our health and our environment. As well as this more parents are becoming more and more sensitive to the very precious and vulnerable time being a baby, toddler and child is. A time we really want to make sure we are doing the right things in all aspects for our children to grow into healthy, confident and happy young people. We want them to be self-assured, secure, emotionally intelligent and peaceful AND we are realising the incredibly important role parenting has on this. This means we not only want to use the best products for our children but we want to implement the right practices, attitudes and means to interact with our children. Olga has been working with families around town in the last 5 years since her first baby was born and she can see the huge demand that moms have with their newborn babies. They are seeking for information that supports their natural motherly instincts. She is an an accredited La Leche League Leader and a Certified Babywearing Consultant so she can provide professional support for these families. As a team our aim is to help you to find answers to all your questions so you can make your own informed decision. Although research is supporting these methods more – it is still a growing niche – it can be difficult to find other parents also doing this. This is your invitation to join us on Sat 29th March 9-13h00 at Alive Cafe in Muizenberg – to browse, shop, advertise, support natural childcare products and services, to listen, discuss, ask questions about Gentle Parenting or just come and relax, chat and play with like-minded parents and babies. Yes! More amazing people are connecting all the time. I think it will be so lovely. We look forward to sharing it with all of you too.